Sending huge congratulations to Wai-San and Phil who celebrated their marriage on Saturday 5th November at The Old Parish Rooms, Rayleigh, Essex. They actually got married a week before in an intimate ceremony in Central Park, New York (very cool!) with just a few close family members and friends but celebrated in style back home in Essex. They chose to have a 4 tier naked wedding cake displayed on our tree slice cake stand and the flavours were a gluten free Black Forest cake with Kirsch soaked morello cherries, Madagascan vanilla sponge with vanilla bean buttercream and raspberry conserve, carrot and pecan cake with orange zest buttercream and red velvet cake with vanilla bean buttercream. Lots (and lots!) 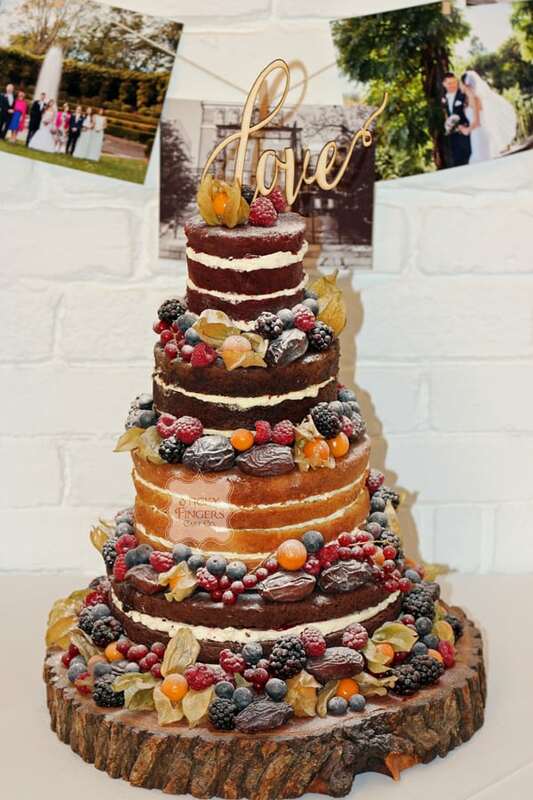 of Autumnal fruits and berries adorned the cake which was finished off with a generous sprinkling of icing sugar. Wishing you both a long and happy life together.